Around 1987 I was into my home audio/video system big-time. Between surround, cassette, open-reel, mixers and synthesizers I spent more time wiring than I did using the gear itself. I thought it would be fun to build a matrix router for all my gear. My buddy Dieter, who taught me a lot about analog electronics, had helped me design and build a 16 channel mixing board already so I thought I would tackle this one on my own. I broke the project up into several boards that were then plugged into a motherboard bus that was contained in a 19″ rackmount case. I’m not sure what became of the front panel/user interface I originally built….that was a few years ago. 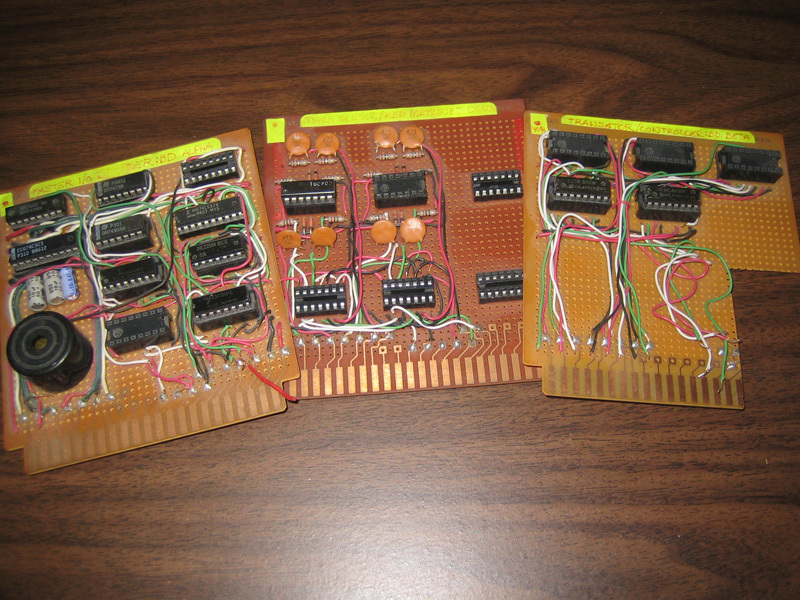 The middle board (pictured) was one of two boards that with custom touch-switch circuitry to handle a keyboard of small metal plates arranged as a phone-type keyboard. You typed “Source” “2” “Destination” “5” and that would send input #2 into output #5. This typing was interpreted by the leftmost board (pictured) into a parallel array of data that was used to control the rightmost board–one of several boards that handled the A/V matrix switching. Note the missing chips that were scavenged for later projects! It worked. A little piezo returned a “click” sound as you touched the metal button/plates giving it a nice “aural feel”. Video quality was weak because analog video circuitry wasn’t my strong point. Audio worked well although bandwidth was weak because of the switching chips I used. I learned a lot about analog circuitry on this. I didn’t take it much further than a few ins and outs….once I realized that the quality wasn’t there it was hard to stay interested.